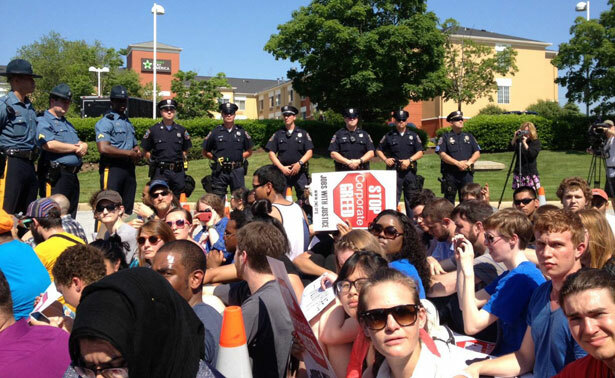 Student groups and their allies confronted Sallie Mae at its annual shareholders meeting yesterday. Nearly 200 students, parents, community members and union leaders rallied at Sallie Mae’s annual shareholder meeting in Newark, Delaware, yesterday. On the agenda: first, demand that the nation’s largest private student loan lender meet directly with students to discuss their crushing debt burden; and second, introduce a shareholder resolution calling for disclosure of the corporation’s lobbying practices and membership in groups such as the American Legislative Exchange Council (ALEC). Gupta spoke out against profit margins that continue to increase for Sallie Mae as “student debt and student loan defaults escalate at an unsustainable pace.” She noted that the senior management team of five executives made more than $20 million combined in 2011; the former CEO—who just announced his retirement—was paid $35 million from 2007 to 2011. The promise of privatization of the student loan industry was that there would be greater efficiency and therefore more opportunities for students to pay for college and thrive. That is clearly not what Sallie Mae and the big banks have delivered to students like Sam, Sara and their families—not to mention the millions of young people who are priced out of college. Cross-posted from my new weekly column on the impact of sequestration at BillMoyers.com. Jobs. They are supposedly the foremost concern of every Democrat and every Republican, and they are certainly the greatest concern for the 20 percent of American workers who are unemployed or underemployed, and the millions of people who have dropped out of the labor force altogether. But you wouldn’t know it from Congress’s lack of urgency to confront and end $85 billion in across-the-board sequester cuts this year, despite the fact that these cuts are already reducing employment and shrinking gross domestic product, and straining state budgets as a loss of federal grants makes it more difficult to fund vital services. Even the very programs designed to prepare the American workforce for high demand jobs—another congressional favorite, at least rhetorically—are being squeezed. Since 1968, Focus: HOPE has served the people of Detroit and its suburbs through career training, neighborhood revitalization and fighting hunger. The training programs have placed nearly 12,000 at-risk men and women in family-supporting careers, including machining, advanced manufacturing, information technology and engineering. But according to Steve Ragan, chief development and external relations officer at Focus: HOPE, just as employers are ready to hire again in the Detroit metropolitan area, sequestration is limiting the organization’s ability to help those looking for work. These cuts are a serious blow to a community that is struggling. According to the Economic Policy Institute, the unemployment rate of African-Americans in Michigan is 18.7 percent, about two and a half times that of whites (7.5 percent) as it has been for much of the last five years. The national black unemployment rate is 14 percent, and of the twenty-four states with large enough African-American populations to track with federal Current Population Survey data, Michigan has the highest African-American unemployment rate. Ragan said Focus: HOPE takes great pride in “maintaining a job placement rate in at least the high seventies for our graduates—and committing to lifetime assistance with job placement.” The organization also provides scholarships for graduates who want to pursue a bachelor’s or associate’s degree. “We have partnerships with most of the universities in the area that have engineering and technology programs,” said Ragan. Palermo Workers Union March from Milwaukee to Mequon (Saturday, June 1, 8 am–8 pm, 35th Street Bridge, Milwaukee). A year ago the owners of Palermo’s Pizza, brothers Angelo and Giacomo Fallucca, fired nearly 100 workers who came together to improve working conditions at the factory and to form the Palermo Workers Union (PWU). For the past year, the PWU and community allies have worked to get the Falluccas to meet with the workers, but they have refused. Now the workers will try to meet the Fallucas at their doorstep. For more information, click here. A Bold Approach to the Jobs Emergency (Tuesday, June 4, 8:30am–4 pm, 20 F Street NW Conference Center, Washington, DC.) We have a US jobs emergency. More than 11 million Americans are still out of work, and the austerity push is only making matters worse. States have been forced to implement deep cuts to emergency unemployment benefits even though almost 40 percent of the unemployed have been jobless for more than six months. This conference features great panels—with great people—on how to create good jobs and raise labor standards. Among the participants: Dean Baker, Maya Wiley, Ellen Bravo, Sarah Bloom Raskin, Nona Willis Aronowitz, Dorian Warren, Annette Bernhardt, Ai-Jen Poo, Gar Alperovitz, Joseph Geevarghese, Madeline Janis and Deepak Bhargava. Presented by the Roosevelt Institute. Register here. 2013 Mississippi on the Potomac Reception (Tuesday, June 4, 6:30 pm–8:30 pm, AFL-CIO, 815 16th Street, NW, Washington, DC.) The event marks the tenth anniversary of the Mississippi Center for Justice, a not-for-profit public interest legal organization that works against the odds to provide legal assistance to some of the most vulnerable and neglected communities in Mississippi, the poorest state in the country. For more information about the reception, contact Lauren Welford at 601-709-0859 or lwelford@mscenterforjustice.org, or click here to sponsor the event or purchase individual tickets. Webinar: Why Community Colleges Should Care about Obamacare (Wednesday, June 19, 2–3:30 pm EDT.) “Obamacare” will expand health coverage to millions of Americans, including students. New forms of coverage are already available to many students, and millions more will be eligible for free or affordable health coverage starting in 2014. Please join the Center for Law and Social Policy (CLASP) for a webinar and conversation with Enroll America and Young Invincibles, two leading organizations raising awareness about the potential impact of Obamacare on community college students across the country. Register here. Audio Conference: Where You Live Matters—Addressing Concentrated Poverty Neighborhoods (Tuesday, June 25, 3–4 pm EDT.) “Location, location, location” has implications beyond real estate. For example, location influences test scores and health outcomes for children. In his just-released book, Stuck in Place: Urban Neighborhoods and the End of Progress toward Racial Equality, Patrick Starkey, associate professor of sociology at New York University, explores and explains why mobility is often an American myth for children who grow up in concentrated poverty neighborhoods, and how place-based disadvantages can be passed on from one generation to the next. Starkey reveals that 72 percent of black families living in concentrated poverty neighborhoods in the 1970’s are still living in similar neighborhoods some forty years later. Join Spotlight on Poverty and Opportunity, along with PRRAC, the Furman Center and the Urban Institute for a national audio conference featuring a discussion with Patrick Starkey about his new research and potential solutions for an urban antipoverty agenda. RSVP here. “Poverty as a Childhood Disease,” Perri Klass, M.D. “The Facts on Social Security Disability Insurance and Supplemental Security Income for Workers with Disabilities,” Shawn Fremstad and Rebecca Vallas, Center for American Progress. Nearly one of every six working-age Americans, or 29.5 million people, has a disability. Some 12 million of this population receives Social Security Disability Insurance or Supplemental Security Income. This report breaks down the benefits of these programs and the issues that people with disabilities face in receiving them. For nonelderly adults, for example, nearly half of beneficiaries take in at least 90 percent of their income from Disability Insurance; for those receiving Supplemental Security, the average benefit is $525 per month, and most have no other source of income. To receive these benefits, however, people face a variety of barriers—which are higher in the US than almost all other countries in the OECD, and worsened by funding shortfalls for both programs. For example, workers need medical evidence from a licensed doctor or medical specialist, must wait five months before they can qualify and must have worked at least a quarter of their adult lifetime—and at least five of ten years before the onset of the disability. Between 2006 and 2008, only about 40 percent of applicants for Disability Insurance were approved. The report’s recommendations include increasing the allowed asset limit for Supplemental Security beneficiaries; reducing the share of earnings that those who return to work are required to put back into the system; simplifying work incentives for those receiving benefits; supporting benefits counseling; and strengthening administrative funding for the Social Security Administration so that benefits are processed faster. “Bridging the Higher Education Divide,” key findings from the Century Foundation Report on Community Colleges. American community colleges enroll 11 million students, or 45 percent of the entire college population. This report reveals shocking figures on racial and class-based separation in college access and funding. Between 1982 and 2006, the share of community college students from the bottom two income quartiles grew, while the other two shrank, leaving a nearly 2 to 1 ratio of those in the lowest bracket to those in the highest. Between 1994 and 2006, the white share of community college students went from 73 to 58 percent, while the combined black and Latino share went from 21 to 33. These race-based figures partly reflect an increasingly diverse population—but relatively stable populations for what the report defines as “the most selective schools” suggest a more complicated story. Over the same period, the white population at these schools dropped only from 78 to 75 percent, while the black and Latino share squeaked from 11 to 12 percent. The most selective schools also have a whopping class bias: 70 percent of students come from the highest income quartile, fourteen times more than those from the lowest quartile. Funding disparities between community colleges—which require the most money per pupil, in part because students who attend them start the farthest behind—and other types of schools tell an even thornier story. Between 1999 and 2009, public research university budgets went up $4,000 per pupil; community college budgets went up only $1 per pupil. How to begin remedying these issues? The report proposes a slate of policies, including: adequate funding floors for community college students based on per pupil costs; tying higher education funding to students with the greatest needs; creating hybrid two- and four-year institutions; and requiring selective four-year colleges to accept more transfer students from community colleges. “Ongoing Joblessness in Mississippi,” Mary Gable, Economic Policy Institute. As part of a series of briefs on racial disparities in unemployment in different states, this report utilizes Bureau of Labor Statistics data to depict the recession’s uneven toll on blacks and whites in Mississippi, the poorest state per capita. In the fourth quarter of 2012, Mississippi’s unemployment rate was 8.7, compared to a 7.8 nationally. For the state’s black population, unemployment was more than double that of whites—14.3 and 5.4 percent, respectively. The disparity reached its high point in the first quarter of 2010, when the black rate (19.8 percent) was more than triple the white rate (5.9 percent).